Yesterday I had the chance for a hike into a friend's cabin for a few hours on a beautiful uncharacteristically warm "spring" day. We brought our snowshoes but didn't need them because the snow was melting so fast that there were bare spots on the road. On the way there we saw two bald eagles and after arriving we saw a Pilated Woodpecker flying near the shore line of the lake. They are splendid to see. 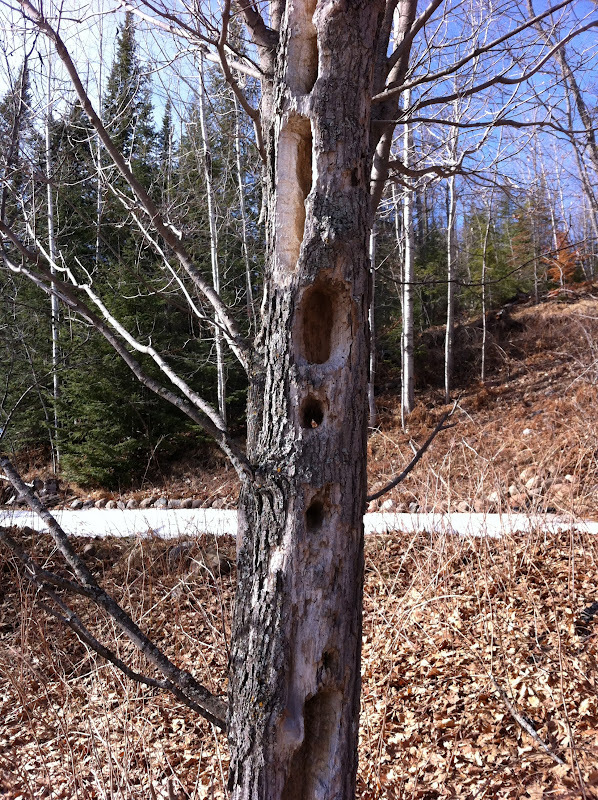 But they also peck some huge holes in trees and stumps. 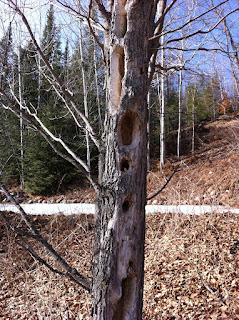 The photo here is a tree trunk near my friend's cabin where the woodpeckers have worked for years to carve out huge holes. They have left the tree there on purpose because of it's reminder of the birds. "Responsible people will maintain gun safety whether there is a law or not; irresponsible people will ignore the law," said Dave Workman, senior editor of the group's publication, called thegunmag.com. He said existing statutes, including child endangerment laws, were designed to prevent such tragedies. Here's the thing. Permit holders are not always careful. They should be. When state laws were passed allowing more people to carry more loaded guns in more places, the gun rights groups said these things would just not happen. People would be careful. Permit holders are law abiding and wouldn't be shooting people or be careless in public. But they have been- too often to count on two hands any more. Permit holders leave their guns all over the place, intentionally or not- in cars, in store dressing rooms, out on a table, in backpacks and purses- where they are discharged on purpose or by accident. Just one of these shootings is one too many. Authorities said Granger was outside the courthouse awaiting the continuation of his criminal trial Wednesday when he grabbed a gun from his truck and opened fire. Seabolt was shot as she tried to run to the courthouse, while others dropped to the ground and law enforcement officers returned fire. "It was crazy," said Beaumont Police Chief Jimmy Singletary. "He was shooting. Our guys were shooting." Judge Larry Gist, whose office is across the street from the main courthouse building, said there was "pandemonium" as law enforcement flooded the scene. Police said Granger fired more shots from his truck then ran over his daughter as he drove away. He abandoned the truck in the middle of the street about three blocks away and took several people hostage at a construction business. Granger told police by phone that he was wounded, then he surrendered and was taken to the hospital. Rife Kimler, Granger's attorney, said his client's 20-year-old daughter had testified against Granger on Tuesday in what was an emotional family dispute, but that he had thought the trial was going reasonably well. "I didn't have him on my list of dangerous ones," Kimler said of Granger. He wasn't on the list of "dangerous ones". Here's the thing. Often people who don't seem to be dangerous can become so in a flash. And when a gun is available to them, not only are they dangerous, they are armed and dangerous and sometimes deadly. Notice that pandemonium reigned at the scene. Notice- there were armed police officers there and they had difficulty stopping the man even while engaged in exchanges of gunfire with him. That pokes holes in the argument that an armed citizen could have saved the day. That is the hole in the gun rights arguments. More guns will make us safer in public. More people carrying will make us safer. Until, of course, we aren't. Until children shoot themselves or a sibling with that gun for self defense in public. Until someone suddenly starts shooting crazily in a public place in a moment of anger or passion. Until..... There are just way too many holes in the arguments for having more guns on our streets. "Notice- there were armed police officers there and they had difficulty stopping the man even while engaged in exchanges of gunfire with him. That pokes holes in the argument that an armed citizen could have saved the day." No it doesn't. It shows that people shooting back works. The shooter was forced to leave the scene and stop shooting people. That is a better outcome than Virginia Tech where no one is shooting back and the shooter essentially has carte blanche to shoot as many victims as he wants. And you think that armed citizens could have done the same? Cho had "carte blanche" because no one knew where he was on campus and once he started shooting, everyone was taken by surprise. There is no proof that an armed citizen could or would have stopped Cho's spree. That is the case in most of the spree shootings. Even armed officers can't always protect themselves - Tacoma shooting as just one example. You are correct when you say that there is no proof that an armed citizen could have stopped Cho. Of course, the opposite is true as well, that there is no proof that an armed citizen could not have stopped him. The question becomes whether or not you wish to have the chance to fight back on as equal terms as possible. Me? I'd rather go down swinging than on my knees praying, but that is my choice. I respect your right to make your own choice on this. I'm not sure that the reciprocal is true. Those cases of children finding guns in their parents' cars highlight an irrefutable fact: children are curious and are drawn to dangerous things. Combine that with irresponsible gun owners feeling they have to have guns with them everywhere they go, even in the car with their children, and you have the makings of a potential tragedy. Completely unnecessary. Children and guns don't mix, even for "gun families" like those of policemen, where gun safety and expertise even aren't enough. "Children and guns don't mix,..."
Mixed for me perfectly well, thanks. Been shooting since i was 4 years old and continue to engage in the sport responsibly. Your anecdotal evidence isn't representative of the whole. Statistics bear that out.
" "There's no such thing as a safe gun. The point of a gun is that it is dangerous," said John Clark, a firearms instructor at Wade's Eastside Gun Shop in Bellevue, Wash. "Its primary purpose is to kill people, and sometimes we lose sight of that fact." Clark said it is up to individual gun owners, not manufacturers, to ensure that firearms are safe around children. In fact, he said most firearms do not have a safety switch, but instead are equipped with "passive controls" to ensure the gun doesn't fire unless the trigger is pressed. Many popular pistols, however, take just five pounds of pressure to fire, making it relatively easy for a toddler to pull the trigger. "Their hands are small, to get at the trigger in such a way that it would be aimed I think might be difficult. To just move the trigger, probably any human can make that happen," Clark said. "He might have to use both hands." Chad Curtis, a manager at the shop, said guns are made to fire easily in case of a life or death situation and are not made with children in mind. "If we over-complicate the weapon to a point that it hinders you and your ability to use it at a time when you need it ... it defeats the purpose of buying one for self- defense," Curtis said, which is why guns should be locked up or locked away when out of your sight. Curtis said gun owners should use items such as trigger locks, cable locks and safes to ensure firearms are safely secured when not on your person." I'm sure those gun owners - the ones whose children are now shot by their weapons - would have agreed with "molonlabe" prior to the trigger being pulled. Gun owners ALWAYS think they are well-trained and safe with their weapons .... until they aren't. First off, these incidents were tragedies that could have, and should have, been prevented. "Curtis said gun owners should use items such as trigger locks, cable locks and safes to ensure firearms are safely secured when not on your person." If you have to disarm because you are a law abiding citizen and are about to enter a "gun-free zone", then I agree (regardless of our differences concerning the effectiveness of those zones). Of course, the more you handle the firearm, the better the chance you will make a mistake, but you still should never leave it out where a child can get it. I can not completely agree if you are in your home. Joan, you have stated time and again that you would not confiscate our guns and that having guns for security in your home is acceptable (please correct me if I am wrong, but that is what I've taken away from what I've read). If the firearm is locked up with a trigger or cable lock, or in a standard safe, then it is not accessible for use if you need to defend yourself or you family in your home. We use a quick release safe as a compromise on this, and that works for us. 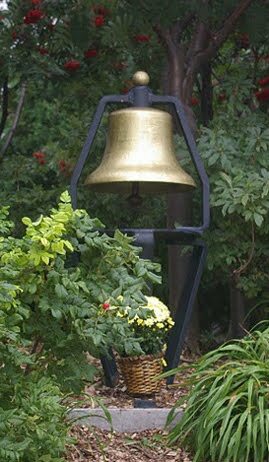 I would not try to dictate a single solution to every situation out there (as I do not feel comfortable telling others how to live), but then I tend to err on the side of individual liberty. I know you do not where guns are concerned, so I guess we can agree to disagree.